The opening of Anguish depicts what is surely an unthinkable nightmare for any parent. A pissy teenager named Lucy is having an argument with her mother Sarah, as they’re driving. Once Lucy throws harsh language at her mother, Sarah pulls the car over to have a chat with Lucy about her tone. Irritated, Lucy jumps out of the car and is hit by a truck and killed instantly. We plunge forward a few weeks in which we meet teenager Tess, who just moved to town with her mother, Jessica. Since she was young, Tess has had emotional issues, often banging her head repeatedly against the wall. Although she is being treated with heavy medications and attending therapy regularly, she’s hoping for a brand new start in a brand new environment. As we know, all to well, a brand new start in a brand new environment isn’t in the cards for Tess! Just as Tess and her mother settle in, she decides to explore her new environment on her skateboard. While skating around she comes across a memorial to Lucy, the teenager who was hit by a truck. 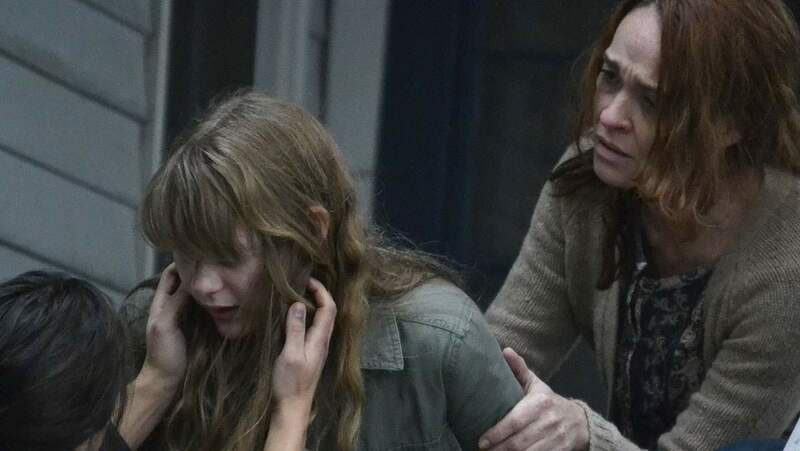 Right after Tess spots Lucy’s memorial, she begins to suffer from severe hallucinations and starts showing signs of being possessed by Lucy’s ghost. Due to Tess’s past, we can’t help but question if this is a case of the supernatural or simply an intensely disturbed teenager. Anguish is a psychological thriller about a teenage girl who is possessed by the spirit of another teenage girl. Does it offer anything new? No. Is the acting great? Actually, it isn’t bad. This film is told from the point of view of a troubled girl who’s mother is overwhelmed with her daughter’s issues. It was beautiful to watch this film because the viewer has visibility to what both parties are going through and can actually feel for them. I went in thinking this was a horror film, but it was much more of a psychological thriller than anything. The opening is unsettling and refreshing. On the other hand, the picture is far from scary and its intensity isn’t fully realized. Director Sonny Mallhi tried to make this a possession horror film, but it’s more of a dark, psychological thriller with ominous atmosphere. Although Anguish is enjoyable, it’s not scary, regardless of the jump scares. My advice before you watch the film? Keep in mind that it is not actually a horror film. There are a few jump scares, but nothing overtly terrifying. I recommend Anguish if you you’re in the mood for a film that is emotionally charged but light on scares. It’s Raining Nightmares – Baby Spiders Fall From The Sky!